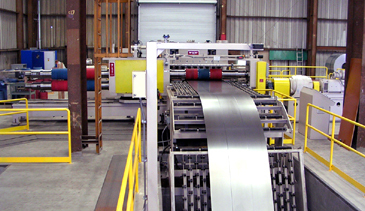 Carson, CA - Pacific Toll Processing, a coil and sheet distributor and coil processor, has installed a high-speed, close-tolerance Multi-Blanking Line in its Carson, CA coil processing facility. The Multi-Blanking Line has the ability to convert bare and coated carbon steel, aluminum, and stainless coil up to 60,000# x 72" wide into panel-flat sheets and precision blanks in gauges from .015" through .135" at cutting rates up to 100-cycles/minute. 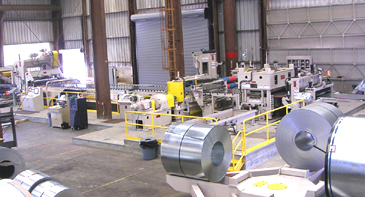 The new Multi-Blanking Line complements Pacific Toll's existing 72" class-1 exposed automotive coil slitting/surface inspection Double-Loop Turret Head™ Slitting Line. Entry Section: Master coils are staged on a 4-Station Turntable that allows quick and easy coil selection and off-loading of rejected coils. A Coil Peeler, Pinch Rolls, Non-Contact Automatic Edge Control, Roller Side Guides, Entry Guillotine Shear, and Cropped End Scrap Cart prepare teh coil for threading into the Cassette Leveler. 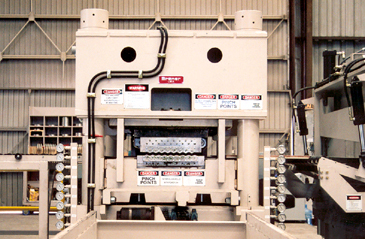 Cassette Leveler: The Pacific Toll's Multi-Blanking Line employs a massive 4-post, 9-flight x 5-Hi Cassette Leveler with 18-independent microprocessor controlled hydraulic back-up cylinders to produce panel flat sheets and blanks throughout a wide gauge and product range. The work rolls, back-up bearings, and universal shafts are housed in independent "Cassettes" that are power injected in and out of the 4-post Leveler frame. The ability to remove and exchange work roll Cassettes allows Pacific Toll to continually expand its leveling capacity with additional Cassettes, each with a different gauge range and prdouct specification. 4-Hi, 5-Hi, and 6-Hi Cassettes with various work roll diameters can be accommodated in the 4-post Leveler frame. Roll maintenance is easily performed outside the Leveler frame (while the line is running wiht other Cassettes) where all working parts are easily accessible. The Cassette Leveler features full automatic entry and exit roll gap set-up via gauge and yield strength operator prompts. A 200-recip roll gap and shape-correction memory stores Leveler set-ups via work order number. Sored reicpes virtually eliminate set-up time and scrapped material when processing partial coil orders. Leveler calibration is accomplished automatically in 5 minutes without tools and instruments. Turret-Head™ Multi-Blanking Slitter: Coils are slit into multiple precition width streips by a 2-head Turret Head™ Slitter installed immediately after the Cassette Leveler. 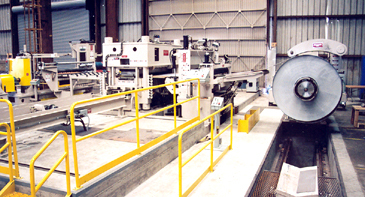 The Slitter is synchronized with the Leveler speed to run at a constant non-staop line speed in order to produce ideal and consistent slit edges. Rubber strippers installed across the entire coil width support thin-gauge wide strips during slitting to prevent strip buckling and related rejections. Utilizing specially formulated precision shimless tooling, tooling set-ups that consistently generate +/- 0.0020" slit width tolerances are completed in 15 minutes.